Die Besprechung bei bleistift.memm.de zeugt von großer Detailgenauigkeit und wahrere Liebe für Radierer. 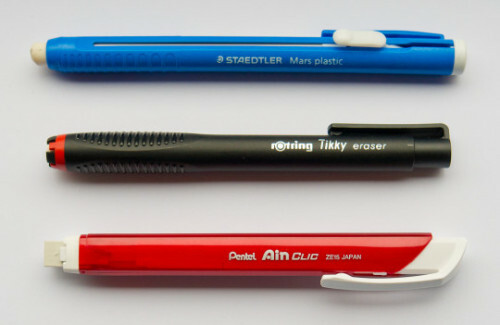 Matthias hat außerdem eine wichtige Information herausgefunden: der Radierer Pentel Ain Click enthält Phthalate - und sollte deshalb nicht von Kindern (oder Erwachsenen) in den Mund genommen werden. “The Ain Clic doesn’t only look good, performance-wise it’s also very good. 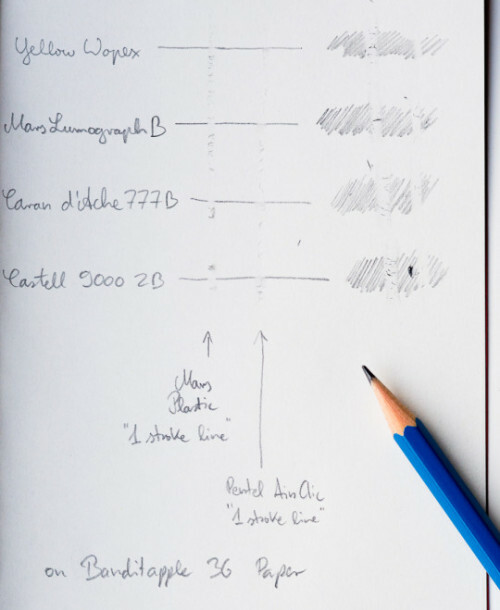 When just erasing with a single stroke (maybe more suitable for artists) performance is not too good, but when repeatedly moving the eraser across the graphite to be erased (which, I would think, is the standard way of doing it) performance is great. With repeated movement graphite doesn’t stick to much too the eraser and the eraser dust will roll up into strands – I like erasers where the dust rolls up like that.